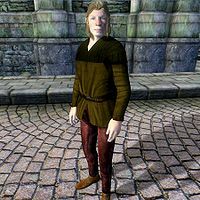 Algot the Northerner is a Nord bard living in the Imperial City's Temple District. He is employed at the Imperial Trading Company in the Waterfront District. Algot leads a leads a typical lower middle class life. He wakes up at 6am every morning to wander in his house's main floor for a while. At 9am he begins his long work day at the Imperial Trading Company Warehouse. He works until 6pm every day, only taking a two hour break at midday to have lunch at the Bloated Float. On Tirdas and Turdas he gets the morning off, and wanders in the Market District from 8am until midday, when he takes his usual lunch before working the afternoon. At 6pm every day, he heads home to wander his main floor until his bed time at midnight. On Loredas and Sundas, the hardworking Nord will go to work at 9am as usual but will skip his lunch at the Bloated Float. There are a few exceptions to his normal schedule. Like the other residents of the Imperial City, he is restricted to his house while martial law is in place during the Light the Dragonfires quest. Algot was also intended to play a role in the unfinished "Imperial Couriers" quest; on the 26th of each month, if Erina Jeranus is still alive, he heads to the Black Horse Courier at midday and spends a brief amount of time there, before resuming his usual routine. During the quest Misdirection, Algot's schedule gets changed slightly. From the time that S'Krivva tells you about Hieronymus Lex and the Waterfront District until you witness Lex's meeting with the Dremora, Algot will not go to work since the Imperial Trading Company is shut down during Lex's search. Instead, he will wander in his house during work hours, and only venture outside for his daily meal at the Bloated Float at 12pm. On Loredas, he needs a change of pace and heads to the Green Emperor Way and wanders around amidst the many gravestones from midday until 6pm. On the 3rd of every month, at midnight, Algot leaves the Imperial City and takes a trip to Bruma. He crosses the Talos Bridge and heads around Lake Rumare using the Red Ring Road. Right after Aleswell he heads north on the Silver Road which he follows for the rest of the trip. It usually takes him sixteen hours and he arrives at Bruma’s east gate at 4pm. Once there, he books himself in at the Jerall View Inn. On this trip, he was supposed to visit Countess Narina Carvain between 7pm and midnight, but doesn't, due to a bug. When the clock strikes midnight on the 5th, he heads back to the Imperial City. Algot wears lower class clothing: a pair of laced leather pants, a dark green shirt, and huntsman moccasins. He carries with him a steel dagger, his house key, and a small amount of gold. Algot is an apprentice at Illusion. Being a bard, this means that he is equipped with three spells: a chameleon spell (15 pts for 15 sec on self), an invisibility spell (15 sec on self) and a silence spell (15 sec on target). However, Algot doesn't have enough magicka to cast the silence spell, so he is restricted to the chameleon and invisibility spells. When spoken to for the first time, and 20% of the time thereafter, Algot will say, "You're talking to Algot the Northerner. Guess you've got nothing better to do." When asked about the Imperial City, Algot will tell you, "I'm here because I'm a loafer. And the city's an easy place for a loafer to get by. I do odd jobs, a little adventuring, build up a little pile...."
While in Bruma, Algot was supposed to visit Countess Narina Carvain in Castle Bruma between 7pm and midnight. Unfortunately, Algot rarely makes it to the castle because the AI package requires him to be within 400 units of the Countess; and every time he leaves the Jerall View Inn, he realizes he is too far away and heads back inside.